Two events inspired Ken to write this story. First, we visited Cochiti Pueblo with our first grandson and watched as Redbird painted and then stretched hides over a drum he made just for us (left). Ken later shared this story with Redbird, who recognized himself in "Red Feather," who crafted the mystical drum. Second, as an interpreter at Rio Grande Nature Center State Park, Ken learned about Albuquerque's last great flood of 1942, which scoured the Rio Grande flood plain. 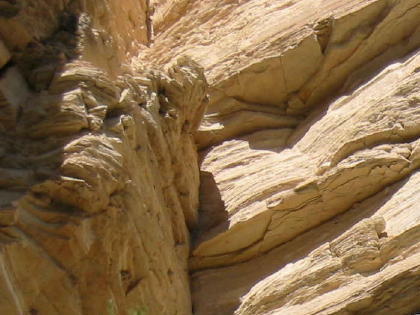 The furrowed and barren mudscape extended eastward as far as Second Street in the city of Albuquerque. 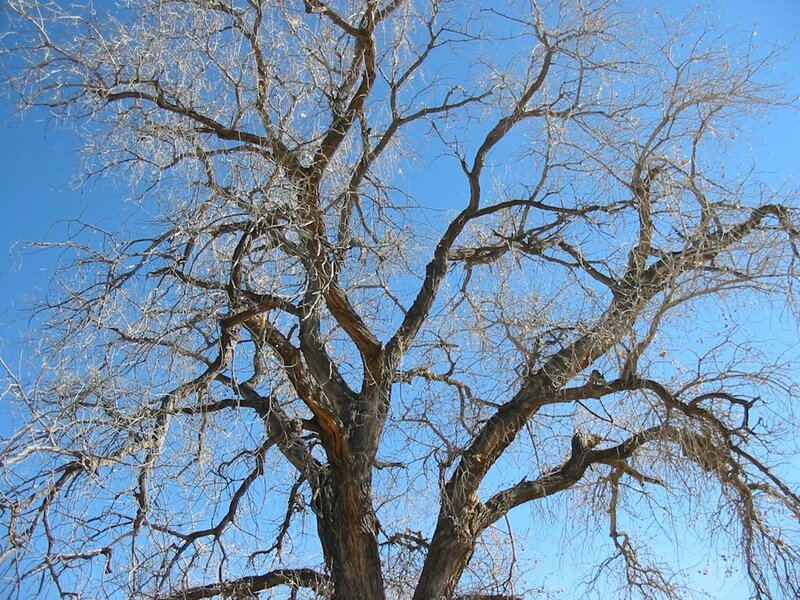 Nearly all the cottonwoods that now grow naturally in the Rio Grande Bosque date back to that great event of 1942. Ken likes to point out that he is older than the trees! Upriver dams, culminating in construction of the huge Cochiti Dam in 1975, have practically eliminated the wild flooding of ages past. The Oxbow in the story, a biologically rich relic of the river's wildest days, lies just across from the Rio Grande Nature Center. It has been threatened by development. Since cottonwood seedlings need sun and a high water table to germinate, none now survive under the canopy of the aging trees and the invasive alien Tamarisk (Salt Cedar) and Russian Olives. A relatively few younger trees have been produced artificially by thrusting limbs ("poles") that take root. These often require supplemental water to get started and must be protected against beavers by wire mesh. Golden Eagle was looking for a rabbit. He was hundreds of miles south of his home range. Yesterday he rode the cold north wind. All day he floated easily ahead of the storm. The clouds had stalled over the Sangre de Cristo mountains of Northern New Mexico. This morning he awoke as the sun rose brilliantly into a clear blue sky. This land was brown and unfamiliar. Snow had covered his Colorado mountains. 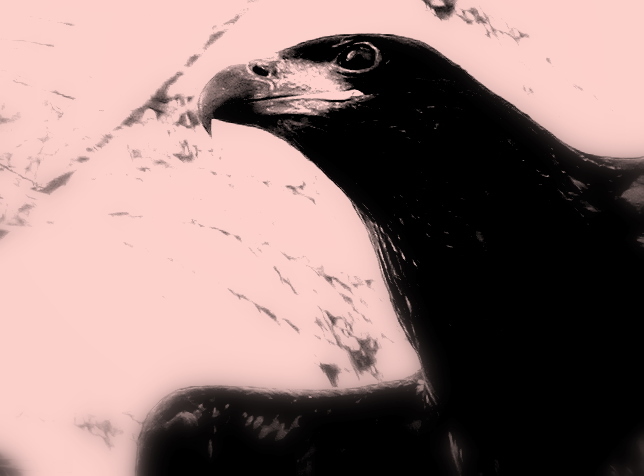 The eagle's parents, who had nurtured him over the summer, rejected him when the days became short and cold. The Snowshoe Hares had turned to mottled white and became hard to find. Now he was driven by hunger. The eagle wasted no time. Soon he was high aloft and moving to the south. The lava cliffs of La Bajada faded behind him. He wheeled sharply towards the northwest. Far in front of him the sun reflected against the facets of black volcanic glass in the Jémez Mountains. With telescopic vision he scanned the bottomlands of the Santa Fé River. Nothing moved. Swiftly, Golden Eagle approached a vast expanse of scrubby land where the Santa Fé flowed into the Rio Grande. 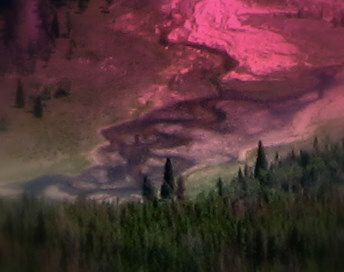 The great river looked sluggish and tame compared to the rushing torrents in the mountains of Colorado. Ahead loomed an outcropping. Perhaps he could surprise an unwary rabbit on the other side. With the sun at his back he swooped low. He crossed over the edge of the cliff. He saw an old and unused corral. Beyond it rose a shaggy Cottonwood tree with a few clinging leaves. Beneath him was a mud house with a flat roof. Smoke curled from the tin stovepipe that emerged from high on one wall. In back of the house sat an old man. But no rabbits. The eagle continued on towards the Jémez foothills. Late autumn sunrise cast long shadows over Cochiti Pueblo. Red Feather was already hard at work. The old man had not slept well. Cold winds found the cracks in the adobe walls of his small home. The fire in his stove had to be fed repeatedly. Most troubling was his drive to finish the project. A cup of black coffee and a crust of bread were enough. He put on a sheepskin vest and was out working before the Dog Star had faded in the morning glow. Red Feather hardly noticed the shadow cast by a large bird. He did not look up. In his hands, he was transforming a stout wooden log. The heavy work was finished. Powerful electric tools had hollowed out the log. His ancestors would have labored many days by hand to get this far, using stone scrapers, aided by setting small fires in the center of the log. Now Red Feather was thinning the inside wall of the log with a keen-edged metal knife. Red Feather struck the log sharply with the back of his finger and listened for just the right sound. Then he removed a bit more of the wood. Many times more he knocked. The amount of wood taken out after each knock got smaller and smaller. Suddenly Red Feather heard a sound very close to what he wanted. Now he might ruin his work if he took away too much wood. The sound of the tap was somehow magnified. It swelled to fill the little valley. It resounded off the rocky ledge that kept Red Feather's corral in autumn noonday shade. The few remaining yellow-brown leaves of the nearby Cottonwood seemed to slowly turn to face the source of the sound. The very earth heaved a sigh as the vibrations faded. Now it was time to stretch pieces of wet hide over both open ends of the log. He cut narrow strips from the hide to make thongs. He laced the thongs in a zigzag pattern between the two hides. As the hide dried it would shrink. The thongs would shorten. The drum would soon be ready. Would it keep its perfect sound? Red Feather was tired and hungry. He was also patient. He knew that it would be hours before the hide would fully dry. The afternoon sun had crept into his work area. It warmed his back. He thought of the round loaf of bread that a neighbor had brought to him yesterday. Another bite would taste so good. But the sun was warm. And the wonderful sound still echoed in his head. The old man fell into a deep sleep. Yet he was aware. He could feel his skin responding to the warmth of the sun. He could even hear the sound of the hides. Under the heat of the sun the hides shrank and dried and slipped across the rough wood. He thought of grasshoppers, of crickets and cicadas. How stunning was their ability to magnify tiny disturbances of the air! The rub of wing against wing. The scraping of leg and wing-cover. Spring mornings and summer afternoons filled with song and sound. Each little bit of tightening of the hides created a ripple that welled up into a tidal wave of beautiful music. Red Feather watched as the seed pod opened. He knew he was seeing something that happened a long time ago. It was spring. It was the time of the floods. The Rio Grande was the wild river that he remembered in his youth. People dared not to live in the lowlands claimed for all time by the mighty stream. 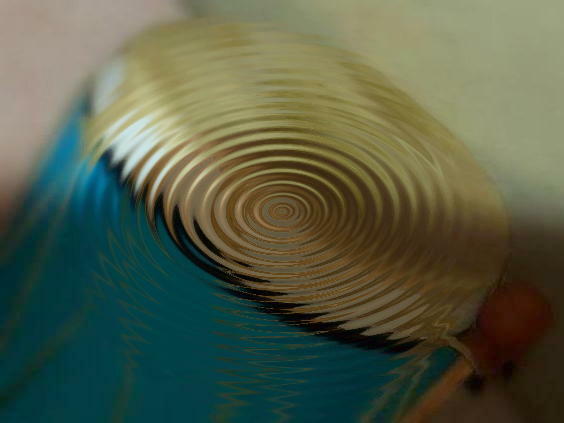 He saw the chocolate-colored waters spread up over the banks and cut new channels. The Coyote Willows bent under the force of the moving fluid but their roots gripped deeply and firmly. Earlier floods had formed stream-side hills. Now they caved in to the renewed violence of the brave waters. Aged Cottonwoods toppled and were swept away. Downy streamers projected from the seed pod and waved in the gentle breezes. Even as the water threatened the gnarled Mother Tree, her last offspring began their journeys into the unknown. Over the ages the Cottonwoods of the Rio Grande Valley had scheduled the release of their cottony seeds to greet the exact time of the high waters. The snow-melt in Colorado had been particularly generous this year. The waters would recede as they always did, to create new mud-flats and sand bars. Stark and barren islands would lie where the water had run deep and fast. The waning flood would abandon cut-off loops to become lakes and marshes where Beaver and Mallard Duck abounded. The Mother Tree swayed as a particularly strong rush of water loosened the last of the soil around her anchoring roots. There was barely a sound as her trunk disappeared into the murky water. Her lofty branches, moments ago so proud, so full of soft green leaves, splashed in turn above the surface as her trunk rotated underwater. Red Feather recognized their gesture as not one of surrender, but of success. For the moment, Fluff was safe. The breeze carried him high above the scene of destruction. Around him, his brothers and sisters and cousins also rode the wind. Their huge numbers would secure the Mother Tree's legacy, unless the breeze steered them away from the valley and into the arid foothills. An entire year's progeny could then be lost. Had it been a dry spring, the parched earth would welcome not a single baby Cottonwood. Fluff floated slowly northward, now losing altitude. His sister, Lint, was quite nearby. Both hit the water at about the same time. Red Feather did not question why he knew male from female seed. Had he given them their names? Would they talk to him? Many times had he spoken to and prayed over corn and bean and squash seeds as he sowed his field. Never did he expect a response. In good years they answered with an abundant harvest. In bad years, plant and man suffered together in silence. The angry waters whirled and bubbled. Fluff rode high. A lucky breeze floated him across the current toward the river's bank. One of his cottony strands somehow tangled with the protruding root of a Coyote Willow. Fluff was stuck fast. Days went by as the water slowly receded. 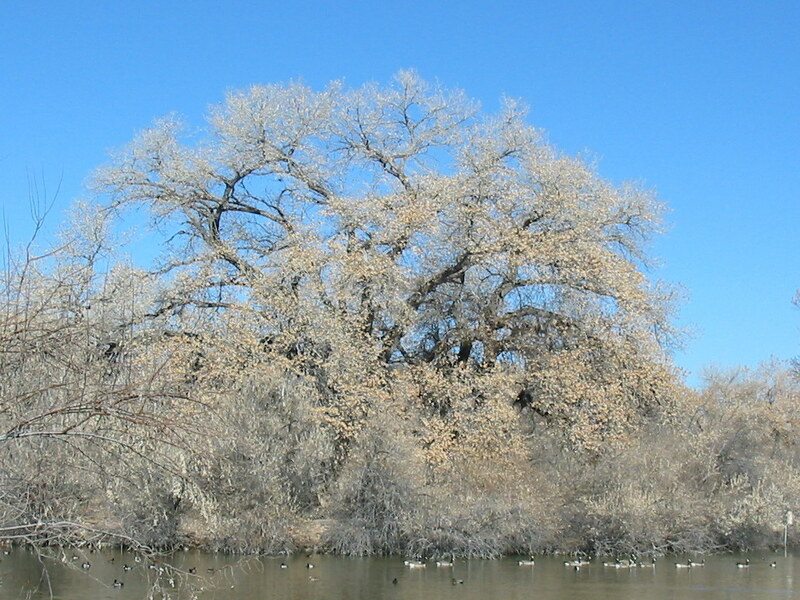 Many of the Cottonwood seeds that had fallen on high land were quickly eaten by birds or carried by ants to their dens. Willow Root had saved him. Then, one large raindrop from a brief thunderstorm suddenly knocked Fluff from his perch. The little seed thrust new roots into the moist earth. A tiny trunk reached skyward. The main stream of the river gradually abandoned the U-shaped loop where Fluff and thousands of other Cottonwood seedlings started out a new life. This was the Oxbow. Soft green baby trees covered several small islands. They rimmed every pool as well as the main channel of the Oxbow. 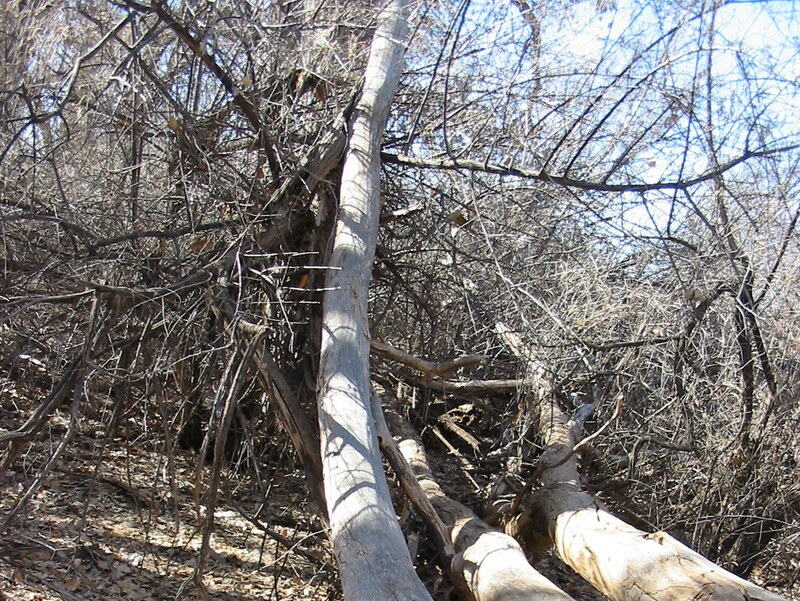 The entire Bosque, the riverside forest, was being renewed. Time was compressed as Red Feather watched the seasons change. Winters were followed by new floods that continually altered the course of the river. There never was another flood so intense as the first. Beavers chewed on the Cottonwood saplings. Most disappeared before their first year. Fluff's sister also held onto life. She was a survivor like Fluff. Somehow, Red Feather knew that his fate was tied to that of Fluff. He watched intently as the seasons rapidly cycled. Over the years the brave river stopped flooding. It flowed lower in spring than ever before. It was straighter and shallower most of the time. No longer was the river free to explore the bottomlands and make new channels. Something held back the spring snow-melt. Red Feather realized that the great dam north of his Pueblo had just been completed. Fluff grew into a great tall tree with evenly spaced branches. He towered over all the other Cottonwoods in the Oxbow. As he put out new limbs they shaded out those beneath. Starved for light, the lower branches weakened and died. Before dropping off they rotted and fed numerous insects. Woodpeckers hunted and built homes in the dead stubs. Irrigation channels were built. Levees and dams imprisoned and controlled the great river. The Oxbow itself dried up completely. Fluff's roots reached deep into the soil to tap the water that no longer rested just beneath the surface. Less vigorous Cottonwoods shriveled and died. New trees from foreign lands invaded the Bosque. Salt Cedar and Russian Olive crowded for space around the Cottonwoods. Their deeper root systems and greater tolerance for drought gave them an advantage. They had few natural enemies. Lint reached maturity. She also fed and sheltered the birds and mammals. Each year she put out pods of cottony seeds that filled the spring air. Yet, no new baby Cottonwoods germinated in the greatly changed Bosque. All the Cottonwoods were growing old. Nearly all had started life the year of the great Spring flood. Now there was a new threat. The Supervisor led his work crew through the underbrush to the base of Fluff, the great Cottonwood. Filled with awe and respect, he gazed upward into its canopy. The Supervisor saw the holes of woodpeckers and the homes of paper wasps and hummingbirds. He saw the Cooper's Hawk nest that had been taken over by a Great Horned Owl. He also saw the red tape that marked the tree for execution. Red Feather tried to cry out as the chain saws roared. He could not see the Supervisor's face. He did not see the great sadness in his eyes. Sawdust flew. A great circle of white wood was exposed as the tree fell. Strangely, Red Feather suddenly became more aware of the chill. He knew the sun had disappeared behind the Jémez. He felt the cold gusts that signaled an oncoming storm. The dream was fading. He so wanted to remain with the vision! Red Feather saw no reason for the destruction he was witnessing. 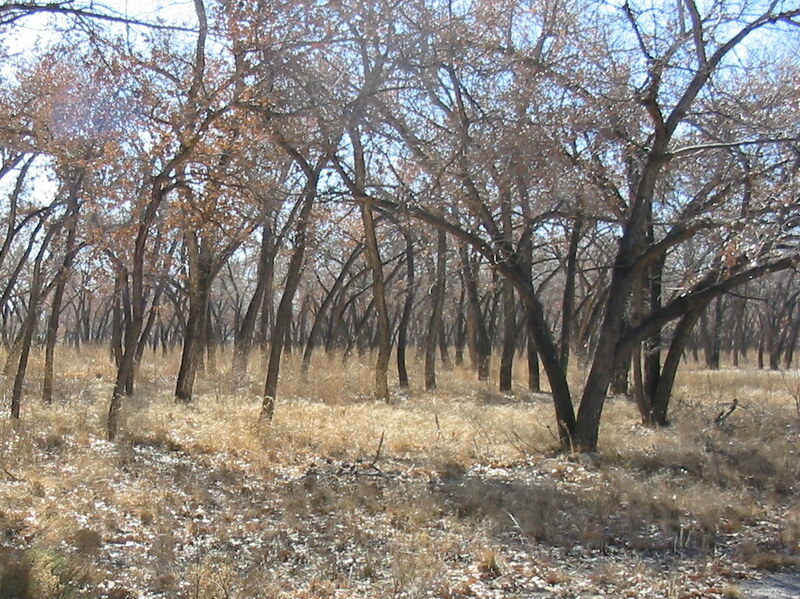 A large section of the Bosque was being laid bare. Why? The Supervisor turned to face Red Feather. Just as the vision disappeared, Red Feather saw that one of the Supervisor's arms was missing. 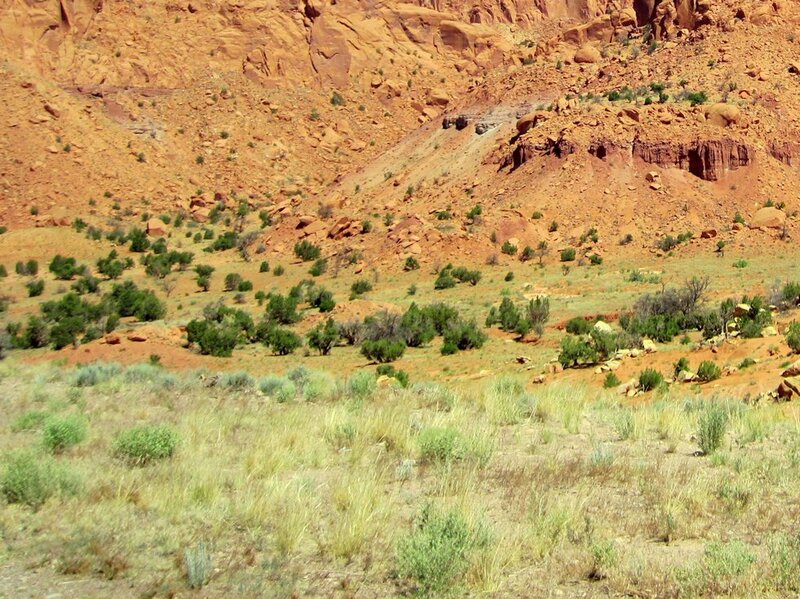 As the village disappeared behind him, Golden Eagle found what he wanted. Soon the storm would drive the Cottontail Rabbits into their forms. Now they scampered among the Piñons and Junipers looking for the last green shoots of grass. They were easy targets. The eagle ate his fill. It was time to rest for the night. 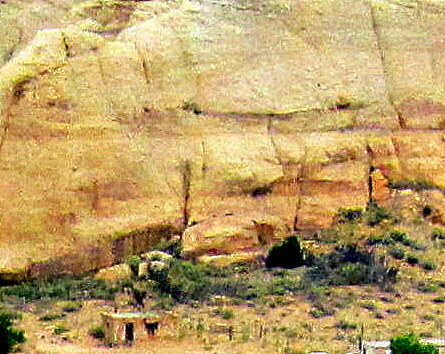 He remembered the Cochiti outcropping. It looked like a promising haven from the rising winds. The eagle cut across the winds to retrace his path. He reached the cliff just as the first snowflakes whirled. A cranky Raven gave up a place on the sheltered rock shelf. The eagle settled down. He then heard the sound. His marvelous lenses pierced the fading light. He saw the stooped old man walking away from the house. The man was carrying something. 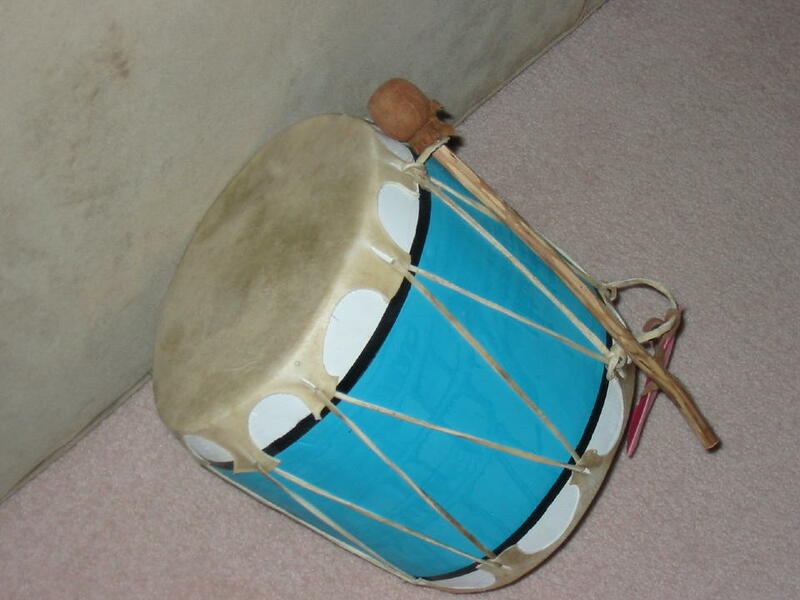 The drum. He disappeared into the blinding snowstorm. Red Feather had stirred himself from the trance with a great sense of urgency. He knew better than to face the storm in his flimsy jacket. Yet he did not stop to put on his blanket and poncho. He carefully picked up the drum. The touch of the snowflakes set it alive. The sound embraced him and warmed him. The drainage ditch was easy to follow despite the snow and the dark. All summer it had returned dirty water to the river from the irrigated fields. Now it was nearly dry. A path followed the crest of the levee created by annual removal of the mud that would otherwise clog the outlet to the river. Next to the path was a dirt road, now abandoned. Red Feather thought about the man in a pickup who had driven this way to his house only a few days ago. The man had looked so sad. He did not want any money for the beautiful Cottonwood log. The man with one arm. The storm had been brief. The dawn was crisp and calm. Sun shone on patches of wind-driven snow. The rabbits would be out early. Golden Eagle opened his wings and set out over the bottomlands, into the rising sun. The eagle saw the old man lying so still at the river's edge. He knew the man was not just sleeping. He did not see the drum. By now it had floated far downstream. It had already come to rest. Against a willow root near the Oxbow.